Today's guest is S.K.Whiteside. 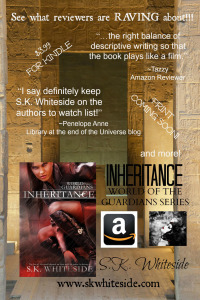 She's hear to talk to us about her new full-length novel, Inheritance. Tricia: Welcome! Can you tell us a little about yourself? SK: I am a former gymnast and cheerleader turned wife and mom. Therapist by day and superhero by night (or at least I pretend to be one). I have an Obsessive Compulsive personality and I have a compulsive need to help others. Tricia: When did you begin writing? Tricia: That definitely counts! I didn't start writing until I was almost forty, so you are not the only one who can't say you've been writing since childhood. Can you describe your writing process? Do you plot or write by the seat of your pants? When and where do you write? SK: I use to be a gigantic pantser. My first few stories (shorts) were all written by the seat of my pants. As I took on new characters and the world became bigger, it became clear to me that I needed to start putting stuff down on paper. Especially for future books. I need to VISUALIZE where I am going. Tricia: Can you tell us about your most recent release? Sekhmet’s life was pretty good; you know for a goddess. Her job was simple – kill those that sought to go against the creator. It was a job she was good at but unfortunately got a little too carried away with when she almost single handedly wiped out mankind. For her penance she has spent the last thousand years serving as one of the Guardians; a group of immortals that protect mankind and led by the Goddess Isis – who kind of had her own anger issues. The Azura, a league of immortal bad asses, are literally trying to bring hell on earth and with it, Set – the banished God and ruler of the Makhaut. For the first time in history and with the help of the Makhaut, they may actually pull it off. Even the Guardians are at a loss. In the Hail Mary of all attempts to save the world Isis, now going by Isira, sends Sekhmet to New Orleans, to find and protect the “Key” but when it is determined that a traitor lies among the Guardians, Sekhmet, now going by the name of Syn, is forced to seek help in the most unlikely of places…her least favorite person and fellow Guardian…Malachi. What’s a former Goddess to do? Tricia: How did you get the idea for the book? SK: I actually came up with the idea when I was researching vampires. I am a huge fan of mythology so when Sekhmet turned up in my vampire research I couldn’t resist coming up with a story about her. I wanted it to be different, witty, and not a love triangle (lol). Tricia: Of all your characters, which one is your favorite? Why? SK: I would say it’s a tossup between Syn and Isira. I just love the concept of strong female leads. Tricia: What was the most challenging aspect of writing your book? SK: Finishing it and putting it out into the world. Sure I had shorts published before but the actual full length novel out there for the world to see is pretty intense…and Terrifying. Tricia: Which authors have inspired your writing? SK: J.K. Rowling, Sherrilyn Kenyon, and S.E. Hinton. I love so many more to read but those are my writing inspirations. Tricia: What projects are you currently working on? SK: Currently I am putting together an anthology of deadly sins called Morbid Seraphic 2: Seven Deadly Sins, and my first Psychological Thriller titled Thicker than Water. Both will be released through Crushing Hearts and Black Butterfly Publishing. Tricia: What advice would you offer to new or aspiring authors? SK: Write. No matter what, just write. Don’t let anyone tell you how or what you SHOULD write. Write. Write for you and write often. Tricia: Thank you so much for speaking with us today, SK. Writer and lover of all things dark and mysterious. Most of her stories have a background in Egyptian Mythology with a modern day adaptation and unique twist. S.K. Whiteside is a Mythic Fiction writer of Contemporary Urban & Historical Fantasy. As a full time Mental Health Therapist, she started writing in Academia but decided writing about things on the "other side of the veil" was a lot more interesting. Living in the Paranormal capital of the world makes it fairly easy for her to come up with characters, many of which are based on of real personas in her life that she can't help but carry over into her writing.